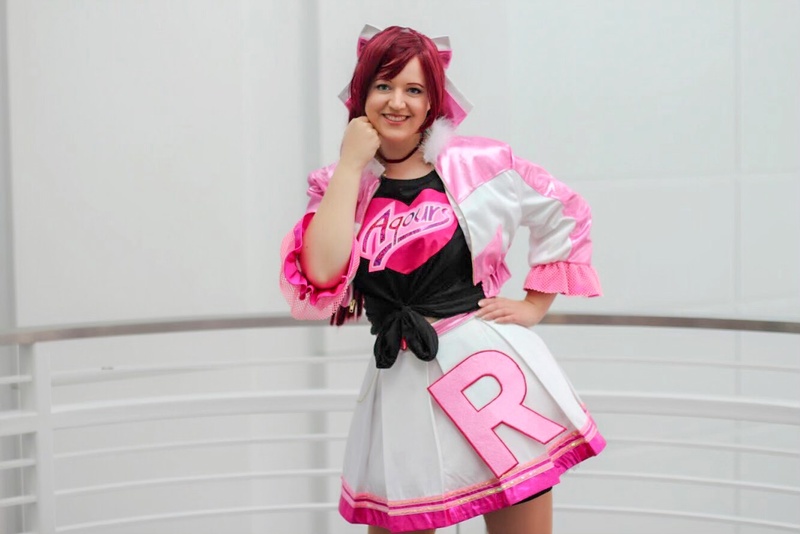 Did you miss Costume Analytics? 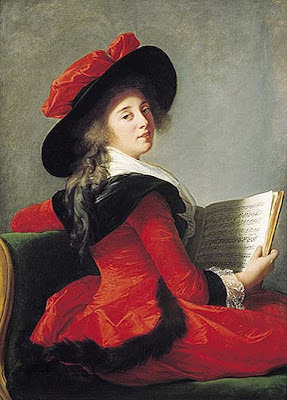 This week we are taking a look at a portrait by Louise-Elisabeth Videe Lebrun, painted in 1785, of the Baroness Crussol. We can tell the Baroness was a very flamboyant lady, with her bright red silk jacket trimmed with black velvet and fox fur. She's very well put together, with matching hat and skirt - we could safely assume even her shoes match. This is a very interesting jacket. We see the back, so let's start there: there appears to be a center back seam and two side back seams that nip in very closely and do not curve much away from the center back. They are extremely closely fitted, and descend down past the small of the back to form the point. 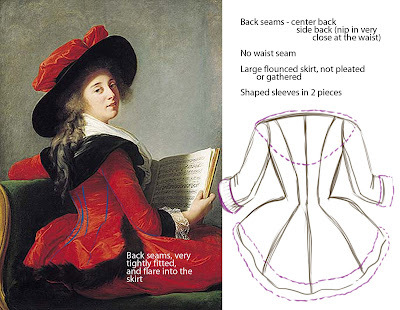 However, there is no waist seam on this jacket, and these three back seams appear to flare out into the flouncy skirt. 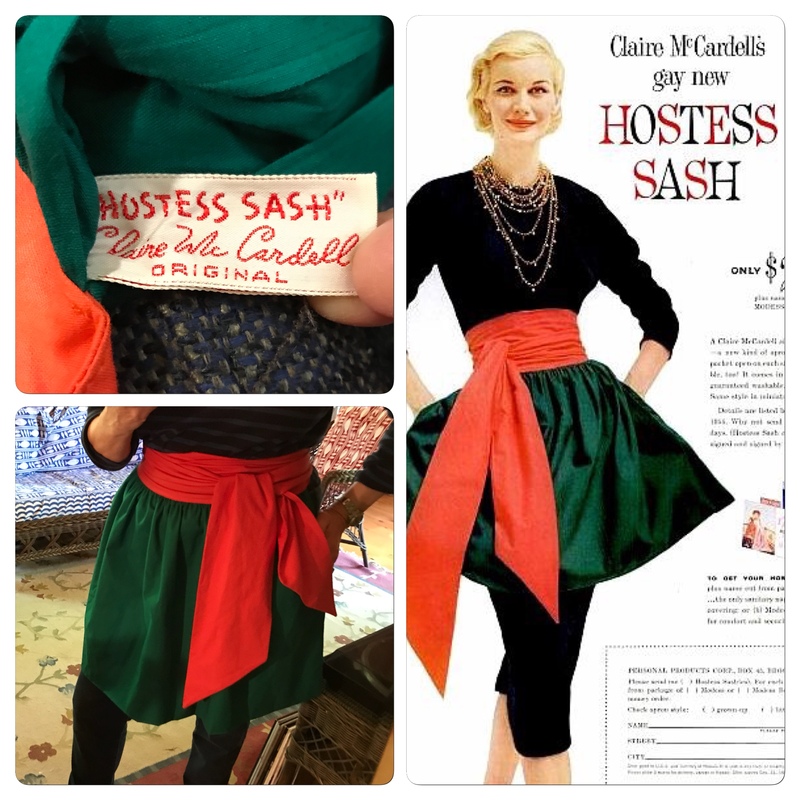 There is also a side seam that flares at the waist. 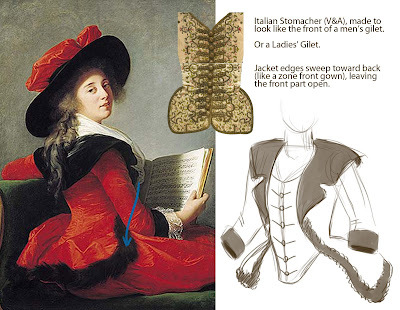 The skirt of the jacket is not pleated or gathered, but is all of a piece with the bodice. The front of the jacket is a mystery, but we can make some good guesses. 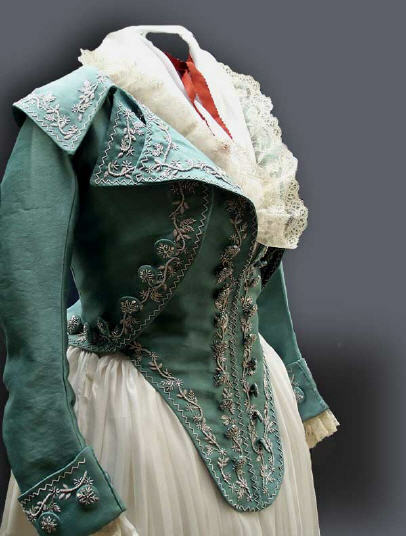 We see the fox fur edging come sweeping back from the front of the bodice, which leads me to believe that the front is open, and the jacket is worn over either a stomacher (such as this Italian example from the V&A T.182-1958 ) or a ladies' gilet, an example of the latter seen in the Kyoto Costume Institute's notorious sea green 1795 jacket and gilet. 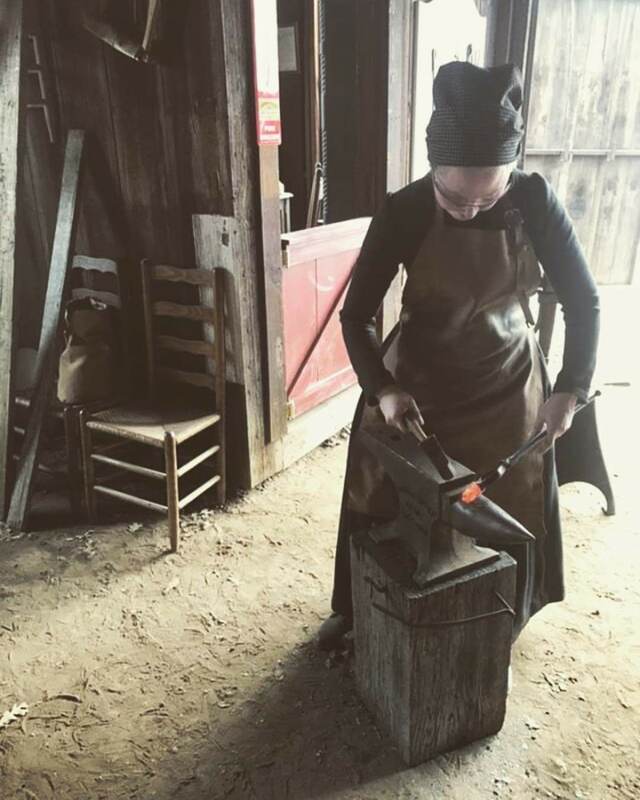 The sleeves are 3/4, with a bit of shaping at the crook of the arm, and finished with a wide black cuff. They are in 2 pieces, upper and lower sleeves. Yet another stand-out feature of this jacket is the huge black velvet collar. We see a shawl drape in the back, and two lapels in the front, which appear to come down very low, about mid-ribcage. As of yet, I have not found a pattern for this particular sort of open-front jacket + vest combination, but some futzing and altering of a caraco pattern could give quite accurate results. The stand-out feature of this portrait is the bold color combination of red and black. We have beautiful shiny red silk (my guess is taffeta, but I'm an addict) in the jacket and skirt and even on the hat, paired with a totally different texture as well as color in the massive black velvet collar, cuffs, and hat. The coup de grace is the fur trim around the skirt of the jacket, which appears to be a fox fur roll. Details include a delicate lacy flounce at the cuffs, and an enormous fichu, probably made of linen. 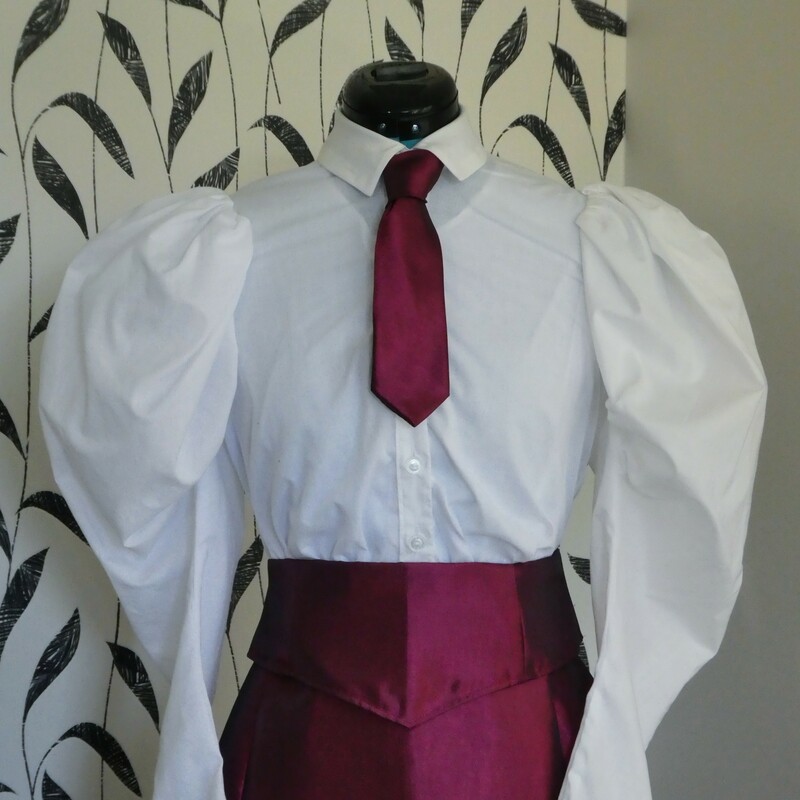 This would have been wrapped around the neck and loosely tucked into the front of the gilet/stomacher/front neckline. The Baroness seems to be all about matching. 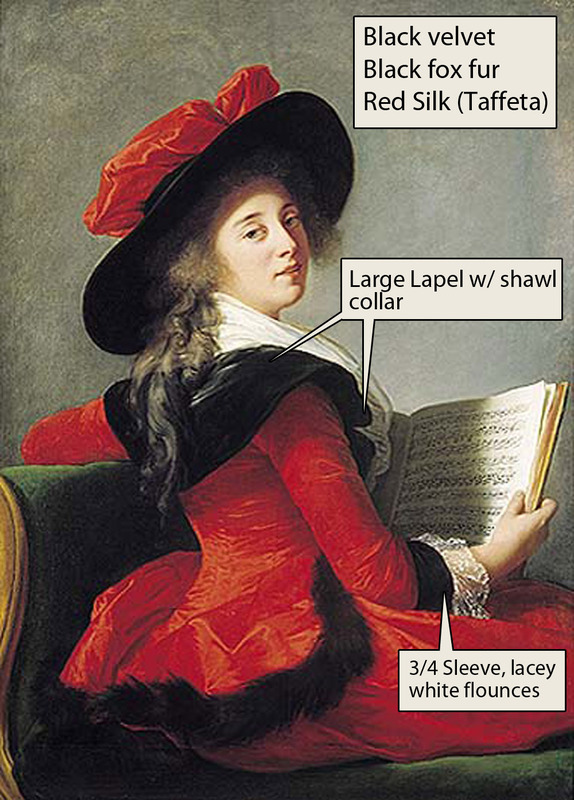 She wears a large-brimmed hat with a puffy crown of the same red silk as her dress. There appears to be a wide band of black velvet at the base of the crown. 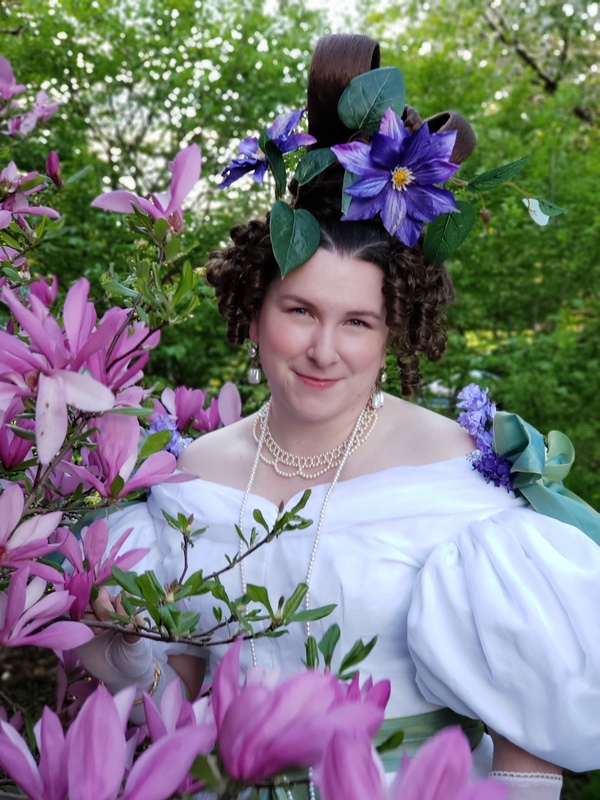 The Baroness wears a "hedgehog" hairstyle, curled, teased, and powdered around the head, with long barrel curl tendrils hanging down her back. 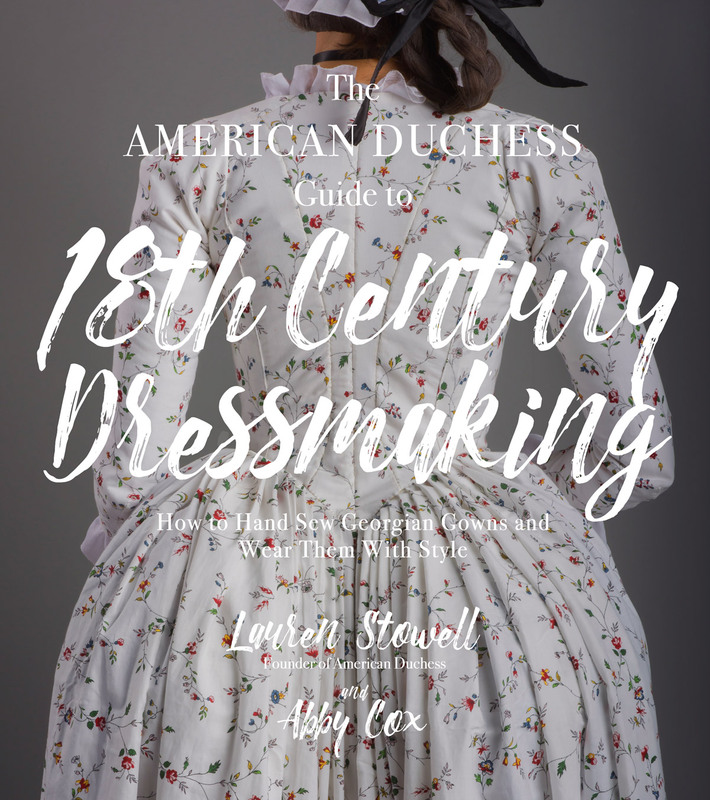 Lastly, we see a large fichu loosely tucked into the front of her bodice. 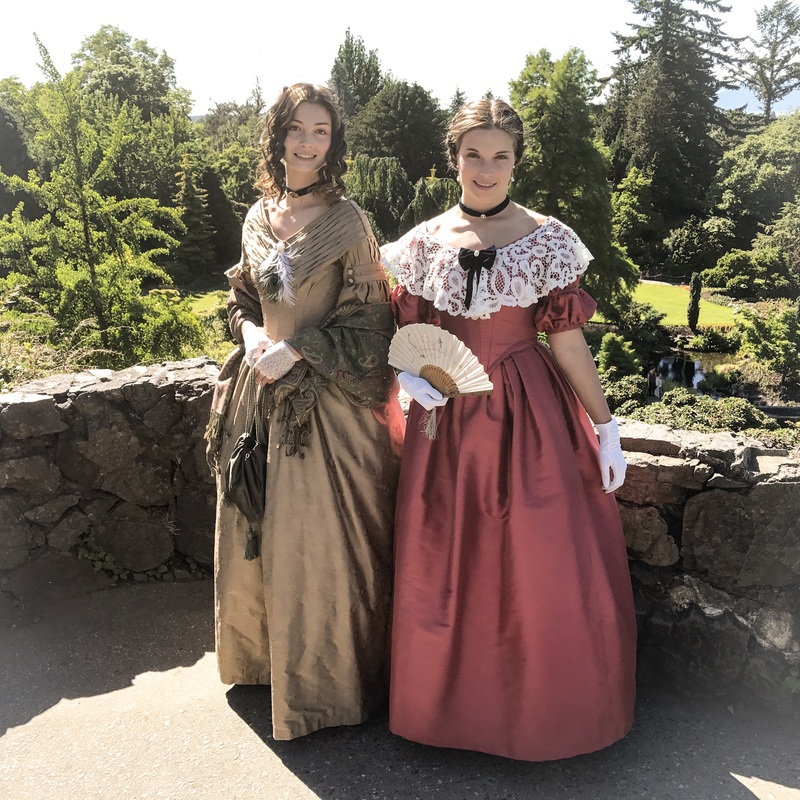 The Baroness would have been wearing a chemise, tightly-laced stays, several petticoats and skirt supports, silk stockings, and snazzy shoes as well. Go for the bold color combination. It doesn't have to be RED, but can be pink & black, cream & black, etc., anything that is eyecatching and sophisticated. 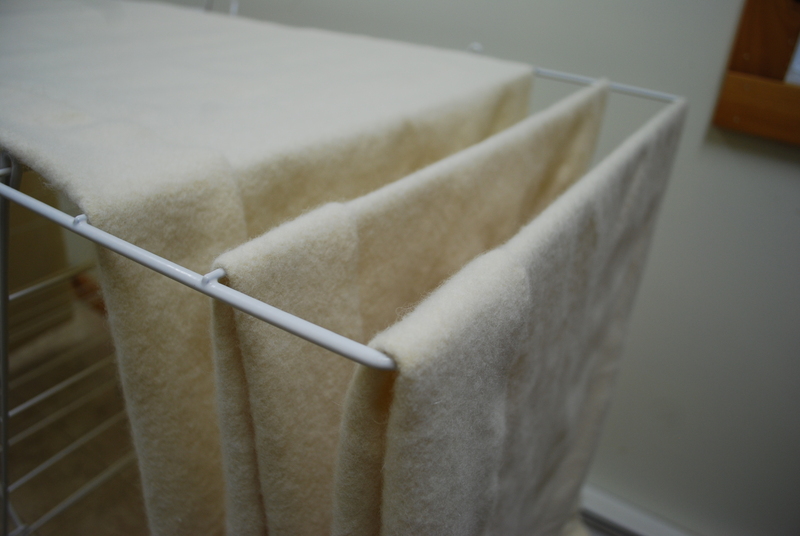 Look for a fluffy faux fur that can be folded over (rolled), or an existing faux fur trim, pre-rolled and ready to go. 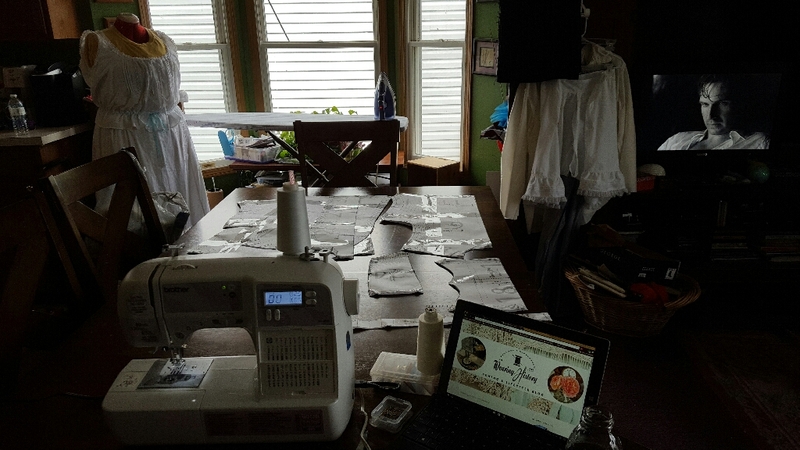 If you would like to sew with real fur, try Glaciar Wear for fur ruffs, or cut into an old vintage fox fur and make your own trim. 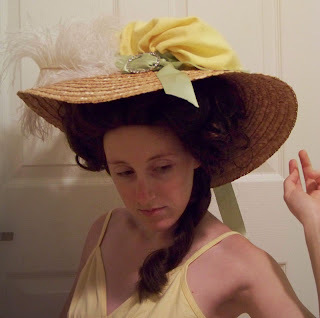 For the hat, make you own using fabrics scraps and a straw hat form from the craft store. Here is a tutorial on the basics of how to make this kind of hat: part 1. part 2. Need a wig? Here is some information for you on how to make your own. Need it powdered? Use corn starch. If the unique and pattern-less shape of this jacket is scaring you, try a different pattern with the same bold colors, fabrics, and trims. JP Ryan's jacket patterns. Janet Arnold (for scaling up). It's a beautiful winter outfit and working with faux-fur isn't something I've done yet. This seems like a nice costume to make. Even more to put on my list of things I want to make! This is one of my favorite portraits and I already have the fabric to make something based on it. Thanks for posting some leg-work! Good choice, it's such a beautiful outfit. I love your interpretation of the front - I'd never thought about it, and never really noticed the collar. Judging by the way it is shaped at the low waist, I'd always assumed there'd be a waist seam, more like an anglaise dress with the pointy "tail" part. Seems like she came to the same conclusion about the waist seams as you did. Have been reading your blog for ages now, and finally have to say, yours is tops on the list. The topics are covered clearly in detail, and with humor. Great combo. Alisa, thank you for posting the links to the reproduction your friend did. It looks fabulous! I'm glad you all liked this post. I went a little more in-depth with my interpretation of the pattern. The problem with doing these posts is that I end up wanting to make every costume I write about. I have a list a mile long! !